On April 18th, Kris Tompkins gave a slideshow and talk at Harvard University about the creation of Patagonia National Park. The event, co-sponsored by the Harvard Mountaineering Club, the Environmental Action Committee, and the Women’s Leadership Project, drew an enthusiastic crowd of 120 people. 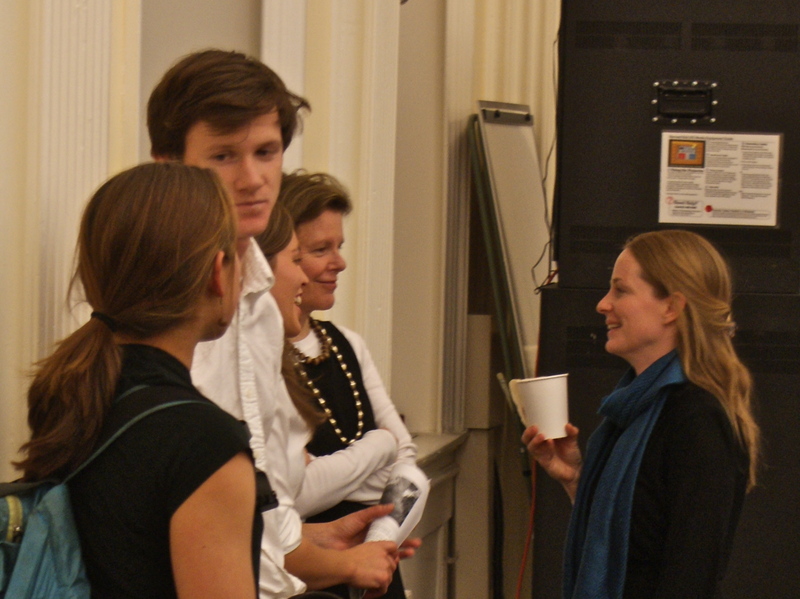 Although undergraduates made up the majority of the audience, the event attracted adventurers and environmentalists from almost every school and graduate program. One of Kris's key messages of the evening. After a lively introduction from the event’s undergraduate organizers, Kris narrated her trajectory from the business world, as CEO of Patagonia, Inc, to conservation and environmental activism. She explained how the different elements of her environmental work—park creation, ecosystem restoration, activism, and sustainable farming—fit together to work towards the preservation of biodiversity, the creation of meaningful work, and the development of alternative economic models. Eliza Lehner, Peter McCarthy, and Tucker Pforzheimer introduce Kris to the assembled crowd. Then she dove into the creation of Patagonia National Park: why build a park there, how a non-profit can actually create a park, and what audience members can do to get involved. Large slides of the park’s landscapes, wildlife and people reinforced her points and gave the crowd a taste of Patagonia’s spectacular beauty. After she concluded, Katie McCann, Conservacion Patagonica’s Vice President, joined her for a spirited and thought-provoking question-and-answer session. Many students lingered after the presentation concluded, eager for a chance to meet Kris and Katie and discuss opportunities to get involved. The idea to bring Conservacion Patagonica to Harvard began in January, when the Mountaineering Club President and Librarian, Peter McCarthy and Tucker Pforzheimer, visited the park to climb, explore, and learn about what “making a new national park” actually means. When they met Kris, her story of connecting a passion for outdoor adventure with saving wild places resonated with them. Along with Eliza Lehner, who spent several weeks at the future park in 2010, they invited Kris to speak about her work to create Patagonia National Park on her next trip to the U.S..
More questions and conversations. Ana Brown, Volunteer Team Leader from this season, describes her five months in the Chacabuco Valley. The enthusiasm generated at the event left us at Conservacion Patagonica eager to continue making presentations to new audiences. Hearing their questions and insights stimulates our discussions about this project, while increasing the number of people aware of our work enables us to create a larger impact. Please get in touch with us at info@conservacionpatagonica.org if you are a college student or involved with an organization or interest group that might be interested in hearing a similar presentation on the future park!